by Marcílio Toscana Franca Filho, Lucas Lexinski and María Belén Olmos Giupponi (eds). Portland: Hart Publishing Ltd, 2010. 491pp. Hardback $252.00/£115.00. ISBN: 9781841139432. With increasing globalization, countries have sought to coordinate the flow of goods and services and workers while also preserving their own sovereignty regarding resources, legal authority, and taxation. Transnational institutions threaten state sovereignty and not surprisingly sovereign states often resist fulfilling their obligations under international agreements they have signed. The present volume explores the challenges that have faced, and are facing, especially Latin American countries some 20 years after the 1991 Treaty of Asunción created Mercado Común del Sur, a common market in the South. Many have discussed MERCOSUR but only few books are available on the Common Market it created. The advantage about The Law of MERCOSUR is its comprehensive discussion that compares MERCOSUR with other organizations, especially the European Union (EU). Latin America’s integration began as far back as Simón Bolívar’s time in the early 19th century, although economic integration became more suitable after military dictatorships of the latter half of the 20th century had ended. The book talks about the philosophy that led to the integration and connection between the various theories of integration. In Chapter Two, for example, Andrés Malamus discusses the concept of “integration,” delving between older and contemporary approaches in the field (p.9). Integration comes out of “necessity” (p.19). It is about desire by countries to pool resources for the benefit of the people. It is an old saying that nations cannot exist in isolation; for, they need one another to survive and develop especially in this era of competitiveness brought about by globalization. Thus, MERCOSUR is a move to not “replicate” failure in the region of some of the organizations that were established but did not live longer than planned (p.23). Andriana Dreyzin De Klor in “The Legal-Institutional Structure of MERCOSUR” analyzes the “political circumstances” that led to MERCOSUR(p.29). To De Klor, MERCOSUR has not happened by “chance” (p.30). When countries are affected by economic deterioration they might begin to think of alternatives. With the coming into being of the European Union, the Latin American nations were forced to adopt another strategy (p.35). Interestingly the organization has developed from a “modest base” despite its challenges (p.37). De Klor states that MERCOSUR has six institutions with the Council of the Common Market being the higher body of decision making (p.40). An attempt was made subsequently to re-organize the MERCOSUR’s structures, but due to the lack of agreement the talk about reform withered away (p.53). María Belén Olmos Giupponi in “Sources of Law in MERCOSUR”, argues that the development [*365] that follows depends to an extent on the members’ commitments. It is to be agreed that where legal principles have not been domesticated development will remain a mirage because the legislation agreed upon is not binding (p.57). This is the “most problematic issue” in the integration (p.59). It is not enough to set up an organization; members’ willingness to ensure compliance with the basic laws can be “quite difficult” but it is necessary (p.68). 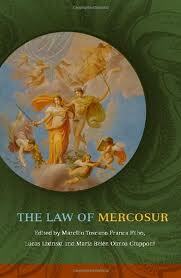 To Giupponi much depends on improvement of the MERCOSUR law (p.71). Giupponi proposes a Permanent Review Court to ensure compliance with the basic provisions of the MERCOSUR’s agreement (p.69). The lack of a Permanent Review Court, or other legitimate dispute resolution body, is further considered in Chapter Five, which treats “Dispute Settlement.” Nadine Susani states that although there has been a Central American Court of Justice, states do not like the “use of the court to settle their disputes” under MERCOSUR (p.73); they have instead used ad hoc arrangements without any “perfect legal order” (p.75). The states created a temporary dispute resolution method by way of consultative opinions. Susani further argues that MERCOSUR has not practiced market principles enshrined in its organizational legal framework (p.87); in essence, Article VII has not been complied with. Organizations tend to disown the principles agreed upon at inception, and instead choose which policies to adopt. For instance, there is no uniform policy on automobiles and sugar. This is because Brazil and Argentina are indebted mostly to these products as their sources of foreign exchange earnings (p.91). Susani also identifies a problem in mobility of goods due to customs duties, whose elimination Susani sees as a “distant goal” (p.127). Dispute resolution is also central to Samantha S. Moura Ribeiro’s “MERCOSUR and the World Trade Organization”, where she reviews interdependency of international trading organizations. Ribeiro argues that there is need to regulate the regional agreements that are multiplying, otherwise they may be chaotic and dysfunctional like MERCOSUR's relationship with the World Trade Organization (p.133). When a serious issue arises this “ambiguity and complexity” in the relationship makes it difficult to know where matters will be referred to, or which of the organizations take precedence – as has happened with Brazil’s dispute with Argentinean law. Regional organizations also find themselves in a sort of cul-de-sac. How are they going to cooperate with neighbours most especially the distant ones? Thus, it is not surprising that the issue of “External Relations” is discussed by Marciilo Tiscarno Franca Filho. Regional organizations cannot function effectively without external cooperation. MERCOSUR countries cannot be satisfied having economic relationships only with countries in their regional bloc; this underplays the idea of integration at the regional level in the world. In an age of globalization it is enough to appreciate that the global stage is “risky” (p.147). Thus Filho argues for cooperation with other regions as well, providing the rationale behind the EU-MERCOSUR relations. There are similar relations which exist between MERCOSUR countries and Africa (p.159) and under the South-South cooperation signed with India, Egypt, Morocco, Israel and Pakistan in recent [*366] years (p.161). Integration is also a subject of chapter Nine, by Philippe De Lombaerde, Frank Matthesis and Charlotte Vanfraechem, who opine that MERCOSUR shows one of the “highest levels of regional cultural homogeneity” in the world (p.173) which at the same time has experienced a unique “process of socio-economic and political transformation (p.189). Apart from sharing common affinity the states have common colonial historical backgrounds and this alone should facilitate integration, but the authors argue a successful regional integration requires more than common cultural affiliation in a “mere formal institution” of MERCOSUR. The obstacle is the numerous private actors who carry power but who act outside or in the shadows of most of these formal institutions (p.190). I find this opinion striking. It provides the bedrock behind the reason why much progress has not been achieved in MERCOSUR. The question to ask here is MERCOSUR ready to accept this reality? Because where you have private interests in conflict with those of an institution then it will be difficult or rather impossible for such an organization to achieve its desired aims and objectives. So if MERCOSUR is not functioning well then the problem is from within. There is also a related concern with regard to other civil matters under the purview of the regional legislation that kept emerging. Experience has shown that many pressing matters do arise which have not been foreseen before the creation of an organization. Some clever organizations have set up mechanisms to address these developments, but others are taken by surprise and they find coping with problems most challenging. Readers have noted that cooperation under MERCOSUR takes place mostly through “treaties” both bilateral and otherwise (p.213). This is what Carmen Tiburcio focuses on in “Cooperation in Civil Judicial Matters”. In civil judicial matters therefore MERCOSUR’s conventions do use letters and “information required by foreign authorities as well as recognition of [*367] foreign decisions” (p.224). Beyond this, MERCOSUR also relies on the Hague Convention for guidance in cases dealing for example, with international child abduction (or legal issues bordering on custody); that is the case of a child’s parents living in different countries. Readers no doubt will appreciate this novelty as it serves to bridge gaps in relation to issues not dealt with by the provisions of the MERCOSUR law. . The issue of water resources has been of interest to nations that share common borders. The sharing of water from the Nile River recently made headlines when Sudan and Egypt refused to sign the new agreement. Interestingly water resources are addressed in “MERCOSUR and Environmental Law.” Correia and Franca compare MERCOSUR with the EU and concludes that the failures of the MERCOSUR integration has been due to (unlike the EU) each Member state having own “public policies” of water management (p.237). Correia and Franca state that MERCOSUR countries must ensure “workable environmental protection framework” which will encourage normative application. This is an excellent opinion; even if the organization will not go further to copy directly from the EU in terms of the use of natural resources. Member states should set up a strategy which should apply to their region and a feasible penalty for any erring country. Hugo Roberto Mansueti’s contribution addresses the “Circulation of Workers in the Law of MERCOSUR” (p.241). Mansueti says that the idea of a market will not be possible unless rudiments of “free circulation of labour” are applied faithfully (p.243). This is seen through three ways as Mansueti states: freedom to circulate what a labourer has earned as his or her wage in a different country to his or her country of origin; freedom to render service and freedom to engage in trading activities in addition to educational integration (p.248). This isn’t difficult as it affects no duties or tariffs. Mansueti holds that MERCOSUR is “not proceeding at the speed” it is wished by its proponents and supporters (p.255). Chapter Fourteen provides a glimpse into “International Taxation in MERCOSUR”. Jamile Bergamarchine Mata Diz analyzes the measures being applied by Member States to coordinate the various taxation policies. This as usual is a hard choice between desire for integration and organizational principles. It may affect sovereignty as Diz would want us to believe because it is a matter bordering on a state’s taxation as constituent of “public resources” (p.263). That is why Diz ends with an answer that at least States should adopt tax legislation that will be current and in tune with the developments happening in MERCOSUR (p.276). In “The Protection of Foreign Direct Investment in MERCOSUR” Diego Fraga Lerner introduces the past efforts of MERCOSUR countries to design a policy towards Foreign Direct Investment. When an economy is integrated it needs to open up to investment, which is “essential to the development” of its own bloc (p.278). As good as this may sound, Lerner should have told these MERCOSUR countries that direct investment provides an avenue for all kind of exploitative transactions. Countries ought to open their eyes or else fall again squarely in the traps of imperialism. So countries [*368] with regional organizations should be cautious and strike suitable deals between regional interests. I am sure readers will agree that exploitation should be detested but nothing should stop countries from entering transparent and sincere global partnership which is mutually beneficial to all. Lúcia Tomé Féteira presents the competition rules of MERCOSUR approved after the signature of the foundational act of MERCOSUR (p. 291). Féteira notes the “supremacy problem” between national and intergovernmental levels of competition law (p.316) and calls for “caution” concerning excessive approximations to European Competition Law (p.316). This is agreeable otherwise Member countries will end up as copy-cats, the very attitude of most organizations in developing world. In “The Protection of Intellectual Property in MERCOSUR,” Félix Vacas Fernandaz emphasizes the link between intellectual property and trade. Fernandez views the “protection of intellectual property rights cannot be achieved with trade regulations to that end” (p.317). Protection for intellectual property rights should be in the framework of integration. This is the best option one can think of in this scenario. But harmonized regulations are still far from reality because some countries are yet to ratify the protocol (p.329). It makes sense as Fernandez states that a multilateral agreement provides the impetus which will cut across a given regional organization such as MERCOSUR. The last chapters reflect on other varying subjects related to integration. Daido Doneda and Mario Viola De Azevedo Cunha analyze “Data Protection as a Trade Resource in MERCOSUR”. After all, some policies must be tailored toward collection of data like a “common regional passport” for the maintenance of security against money laundering, terrorism and other organized crimes notably narcotics, the most common in the region. How can Member countries analyze the different data they have gathered or still gathering? How do they deal with common crimes or help other friendly countries from tracking international criminals? How do Member states assist other individual international security outfits in making the world a safer place for all humanity? How could countries protect the rights of law abiding citizens since MERCOSUR as Mario and Cunha argue has “no effective legislation on data protection” (p.385)? When citizens move around their data also move at checkpoints and points of entry. It is agreed that the need to [*369] protect people’s data creates diverse problems “in fostering commercial ties” (p.384). Control of data should be of interest lest it fall into the wrong hands and then be used against the national interest of the countries where the information was gathered. For the over 250 million people, it should be MERCOSUR’s concern to ensure that data stored are used in the best interest of the region rather than third parties. Mario and Cunha should have stressed this in their discussion so as not give any room for the violation of people’s privacy in the name of security. The creation of MERCOSUR might have something to do with oil, and this book would have been incomplete without a chapter dedicated to oil since some MERCOSUR countries are blessed with it. In this context, Hannes Hofmeister addresses the potential of the region in “Energy Markets”. The Western Hemisphere is the region that controls “10 percent of world’s oil reserve” and “5 percent of its gas reserves” (p.387). MERCOSUR is a serious instrument on this score, as it has come of age by having a common policy in this vital cash cow. The ‘irony’ if Hofmeister is to be believed is that these resources are but “concentrated in politically unstable states” (p.387). I am sure many critical readers will disagree with this assertion even with the ongoing global politics of oil (and by extension other lucrative resources) which unfortunately have caused chaos and havoc in a number of countries. We are living witness to what is going on in Iraq, Libya, Venezuela, Nigeria, Syria, Iran and similar hotspots. Hofmeister left readers to wallow midstream without any helpful or intelligent analysis as to who causes these states in South America or elsewhere to be unstable. This left the discussion, in my opinion, strangely incomplete. I have no problem when countries decide to share their resources with distant neighbours but the immediate communities (or citizens) should benefit first (p.393) otherwise it will be a disaster as the people end up with no concrete development while their leaders dilly-dally with their chosen ‘partners’ and other cronies who daily eat from the crumbs of oil resources around the world in ‘shadowy’ commercial transactions. The tail end is where Fabiano De Andrade Correa analyzes “Regional Integration and Development” with a specific interest in the recent Fund for Structural Convergence (FOCEM). Correa sees FOCEM as a “near and welcome initiative” but there seems no vivid ways to follow (p.411). I wouldn’t want to buy Correa’s outlook that the “EU’s regional policy can provide important lessons for FOCEM” (p.412). No two societies are the same; for, Europe and Latin America are no doubt two distinct areas geo-culturally. To critics, most of the problems in developing countries stems out of their rush to be copy-cats of alien economic policies and theories. I feel it is high time to rethink this. Luca Lixinski and Fabiano De Andrade Correa take readers into “The Legal Future of MERCOSUR”. To them even with problems MERCOSUR is a “most successful” regional integration. What yardsticks Lixinski and Correa use remains unclear (p.413). It is agreed that MERCOSUR is “moving at its own pace” (p.442). Finally Chapter Twenty Four introduces the English Version of MERCOSUR Treaty and Protocols. Luciana [*370] Carvallo reviews the translations of the treaty and protocols. Carvallo adds that there is “no official English translation” of the law (p.425). Carvallo however made small changes that result in more idiomatic solutions and replaces long old drafting style such as “the judicial body making the request” becoming “the requesting judicial body”. None of the contributors suggest to the Member States the need to review the law in line with the new plain English language being introduced in drafting legislations worldwide. Good translation of the law is paramount if it is meant to be understood clearly by the people and the policy makers; otherwise such law will be archaic and problematic even to the judges, who are responsible for its interpretation in the courts of law. Despite divergent discussions, the common preoccupation of the contributors is that MERCOSUR is not after all a failure but much needs to be done. You cannot have a perfect regional organization without its complementary aspect – the will to make its law supreme (i.e. the legislation in respect of the regional organization in question) above national interests (read, policies). The Law of MERCOSUR helps deal with these challenges and explores huge possibilities by providing various options for the regional players – the need to comprehensively implement MERCOSUR principles and to be serious. This, no reservation, is a good book for those wishing to understand MERCOSUR’s dynamics in Latin America. © Copyright 2013 by the author, Kawu Bala.